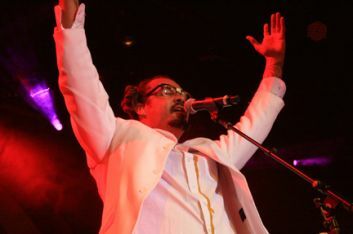 In the long tradition of free concerts in Golden Gate Park, Michael Franti threw the 12th annual Power to the Peaceful Festival. The specter of 9-11 loomed over the grounds in different speeches and themes but the music is really what mattered. The grounds were packed to the limit as Franti and Spearhead took to the stage to provide music to the masses. Each year the festival seems to get a little more popular and this year was no different. At a maximum capacity, Speedway Meadow almost got a little too crowded. The fans hung in though and a wonderfully energetic set by the guys seemed to mellow the crowd that had at several points gotten a little testy. The festival was a wonderful prologue for what turned out to be the highlight of the events. The official afterparty took place at the historic Fillmore in the middle of San Francisco. Taking on a musical costume, Michael Franti and Co. adopted the persona of the Talking Heads. Dubbing themselves, “Rocking Heads” the band turned out a smoking set of Talking Heads songs, complete with a cameo from Jerry Harrison, an official Talking Head. High on inspiration, if a little weak on rehearsal, the band proudly poured their hearts into the material and blew the roof of the old ballroom with extended sing-alongs and crowd participation. Even if the band managed to blow the lyrics on almost every song, musically they could not have been hotter. With a new album on the charts and a successful festival just wrapped up, the gig had a definite afterparty feel. Michael bounded onto the stage in the Byrne-esque white suit and ecstatically bounced around the stage and into the audience and back. The Rocking Heads set hit the highlights of the Heads’ catalog with each song jammed out and turned into a musical journey. After plenty of guests, the band stepped off for a quick break and came back as Spearhead for a short set to end the night. Fans of all ages were at the festival but it seemed that the Rocking Heads show was mainly a treat for the band and a smaller group of fans. The crowd was by no means huge but was extremely boisterous. David Byrne is one of the best songwriters of our era and his complex, idiosyncratic lyrics don’t come easy. To Franti’s credit, he made up for a lack of lyrical prowess with amazingly energetic exhortations of the crowd and a professional command of the stage. Once the crowd had relaxed a little, the band came back as Michael Franti and Spearhead and played a handful of cuts from across their catalog. It was a nice and mellow cap to the smoking set of tunes that came before it. The crowd spread out and danced to the reggae beats and socially conscious lyrics that are Spearhead’s stock in trade. After an audience request and an announcement about Sundays events, including a yoga class at the Fillmore, the band broke into “Sound of Sunshine” from the album of the same name. It was a great cap to a night that truly rocked our heads. Hopefully, as Spearhead becomes a bigger and bigger draw, the Power to the Peaceful Festival won’t outgrow its welcome in Golden Gate Park. After twelve years, this San Francisco institution just keeps getting better and better.